The Salt Union Ltd, a conglomerate of English salt works owners, came into being in 1888 and at some time between then and 1892 they purchased the Droitwich Salt Co Ltd including the Covercroft Salt Works. The Covercroft was the last of the salt works in Droitwich and its closure in 1922 ended salt production in the spa town. The area has now been redeveloped but the name lives on as an access road to a new superstore. AVON was transferred to the Stoke Prior Salt Works when the Covercroft works was closed in 1922. The photograph above is a view of the Covercroft salt works taken from Ombersley Street. The photograph is reproduced by kind permission of the Droitwich Heritage and Information Centre who state that the photograph was taken about 1912. However this image also appears on page 111 of 'Droitwich - A Pictorial History' by Lyn Blewitt and Bob Field who give an alternative date of 1899. In October 1888, the Salt Union Ltd purchased the Stoke Prior salt works from John Corbett along with the railway sidings, a connection to the Midland Railway and two locomotives. The Salt Union Ltd was a conglomerate of prominent owners of salt mines in Cheshire and elsewhere. The union rapidly established a virtual monopoly on salt production in England with the intention of raising prices and profitability. The Salt Union Ltd paid John Corbett £660,000 for Stoke Prior works, a huge sum in that time and arguably considerably more than it was worth. As part of the sale, John Corbett was appointed to the board of the Salt Union Ltd and as the Managing Director of the Worcester Division, thus in effect he realised his assets but remained in charge of the works in a similar position to previous but without the financial responsibility. 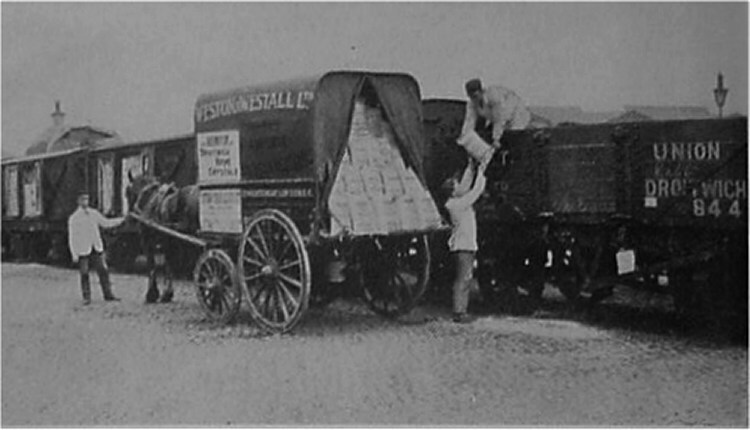 The above photograph appears to show salt being unloaded onto a horse and cart from private wagons owned by the Salt Union Ltd . The location is not known. (Collection of Andrew Smith). 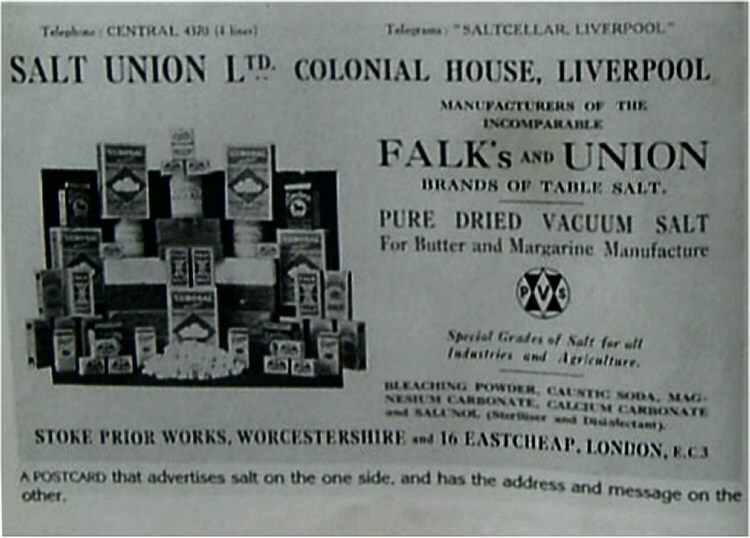 The above photograph is from an advertising postcard produced by the Salt Union Ltd. (Collection of Andrew Smith). The Salt Union Ltd sold the Stoke Prior salt works to ICI's Salt Division in 1937 along with the three remaining locomotives listed above.